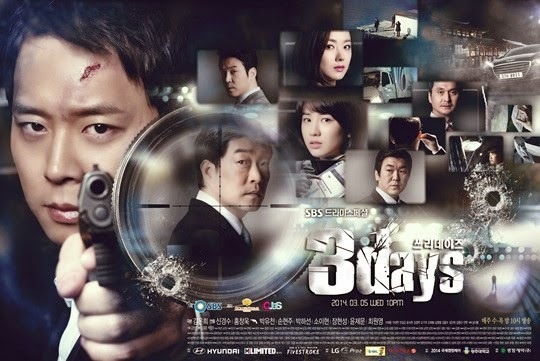 I can’t believe, after all this time, Park Yoochun’s new drama, Three Days, is ready to premier next week. I’d say “wow—time flies” but is it just me or has it been forever for this to make it to the screen? I guess that’s the trouble of learning of things when they are but a whisper. Of course, as anticipated, my interest in the drama has waned. What can I say? I’m a finicky Kdrama fan—my interest is here today—gone tomorrow. I do have to say I was a bit surprised at the change in plots (as to what was originally reported, who knows, this may have been the actual plan from the start). The drama still takes place over 3 days; however, instead of focusing on the kidnapping of a president, the drama is split into 3 sections: first the time leading up to a presidential assassination plot, then the execution and failure of the plot, to finally, the aftermath (you know the catching of those there bad guys). It will be a high tension, pressure filled, and, if done right, edge of your seat sort of show. Which probably means it is not a Stephanie sort of show. What can I say? I get stressed easily. My life is stressful enough. Part of what I like watching Kdrama is it makes me unstressed. I guess we’ll just have to wait for the show to get underway and more reviews to come in. Still interesting though—the idea of Park Yoochun as a secret service agent for the Blue House. Something tells me that he will be able to pull this off easily. I also like the idea that he’s going to be someone who isn’t brilliant, but instead as someone who is so determined in his will and beliefs that he pushes himself forward through the ranks. Come on—who doesn’t like a good underdog story? As it is the week before the premiere the final posters have been released, as has a teaser—which unfortunately—didn’t really tease me. Maybe it worked for you guys? Is there anyone out there who is really looking forward to Three Days? Actually, here’s a longer one which is more interesting. I wonder, since it’s taking over for the ratings hog, You From Another Star, if it will come out of the gate with huge ratings. It certainly worked for Wonderful Season. That drama, picking up right after the end of the end of the very successful Wang Family, raked in 30% for their first episodes!